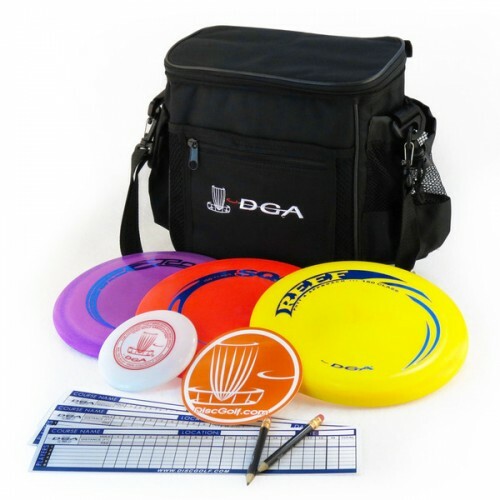 The DGA Complete Starter Set makes it easier than ever to start playing disc golf. It includes the DGA Starter disc golf bag, the Rogue distance driver, Squall midrange driver and Reefdisc golf putter and approach disc. The set is completed with a mini marker, score cards, pencils, sticker and rules of recreational disc golf. The DGA Pro Line Squall is a revolutionary midrange driver that is slightly understable. It features a driver-like grip, smooth release, incredible speed and control for hyzer, anhyzer and straight shots. It will hold very long anhyzers, as well as any flip to flat lines. It is one of the fastest midrange disc golf discs on the market. The DGA D Line Reef is a slightly understable putter and approach that evolved from the revolutionary Discraft APX mold. It has a slow, straight flying, controllable flight path with consistent fade. The Reef can hold any line that you put it on when approaching, and is the perfect flip-to-flat putter (flattens out during flight).